If you read my Dead Rising 4 review, then you’d know that I had many issues with the title, but I’m pleased to say that, while the first major DLC titled Frank Rising isn’t perfect, it corrects many of the gripes I had with the original game. Spoiler Alert. This review reveals Dead Rising 4’s ending. Frank Rising takes place immediately after the ending of Dead Rising 4 (DR4), which had (Spoiler Alert!) Frank West overtaken by a group of zombies and presumably dying. Whether Capcom thought unwise the killing of its franchise’s biggest icon, this DLC unquestionably gets him back on top of the game: Franck did survive the zombie attack, albeit with the side effect of becoming somewhat zombified. I write somewhat because despite not being able to pick up weapons, drive vehicles, or consume food, Frank still retains enough of his faculties to communicate and think at a human level. 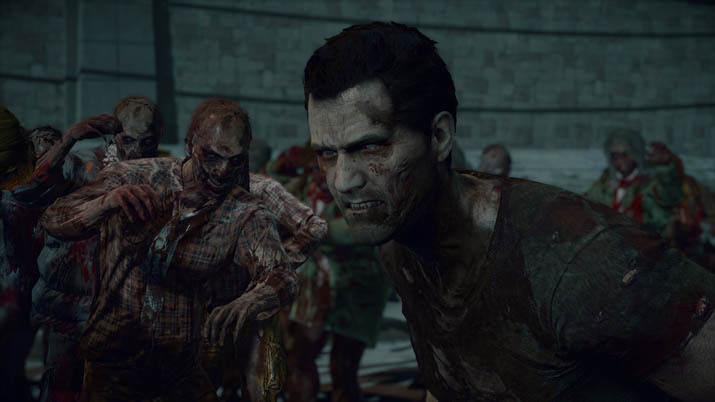 Such zombification and Frank’s desire to return to his regular, full human self is the crux of the story, and while it might not share the subtleties of Tolstoy’s War and Peace, the simple concept make much tonal sense in the Dead Rising series. 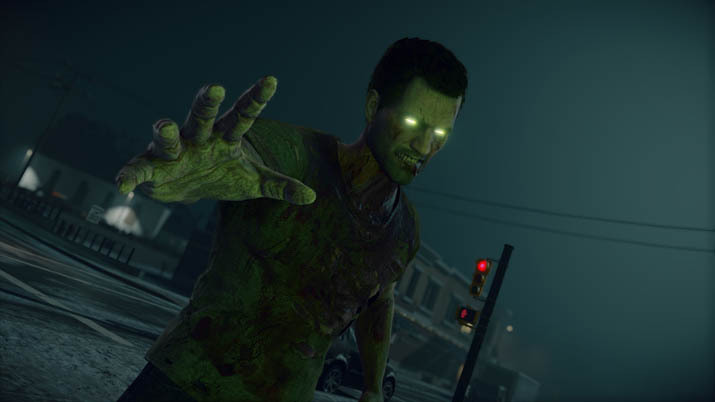 Frank Rising’s campaign starts with a short tutorial, a mission where players have access to all the zombie powers Frank will eventually wield throughout the DLC. You also learn that Frank can no longer heal himself through the consumption of food, and instead must feast on zombie or human flesh. Bite isn’t free, though: you must first fill up a “Hit Meter.” The more hits you get, the greater the amount of health you receive from chowing down the tasty flesh. Now the fact that Zombie Frank is drawn to eating other zombies begs the question. Why wouldn’t zombies just eat each other, since zombies are in far greater abundance than human survivors??!! After encountering and being spared by characters from the base game, the ole familiar timer is introduced in the DLC. Players have an hour and a half to complete all missions and can use any extra time to grab collectibles or complete challenges, which reward traits and upgrade powers respectively. These side activities are where we see two significant improvements over Dead Rising 4 proper. The first being that the short length, combined with the inability to collect everything in one go encourages multiple playthroughs. 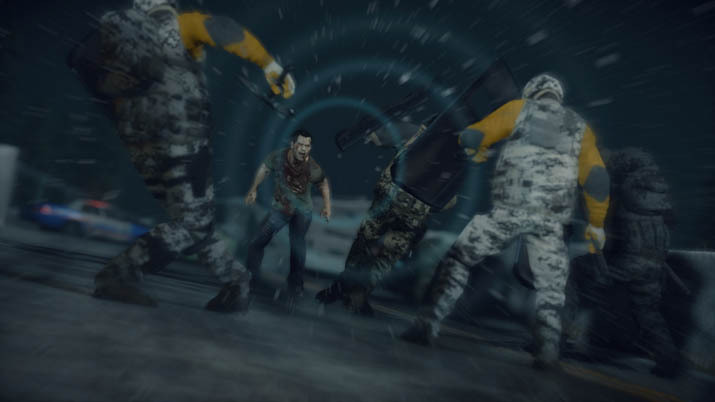 Repeating campaigns to further level up is core to the Dead Rising series, and the mechanic makes its return in this DLC, which is a welcome feat considering DR4’s infinite grind for XP, which gave little reason to go back for more. On aside note, there is, however, a caveat to restarting campaigns, and something I wish I had known beforehand: while you keep perks gained from collectibles across subsequent playthroughs, zombie powers earned through challenges reset at every turn. Had I known this, I wouldn’t have wasted as much time on my first session completing those. Well, at least now you know. The second major improvement is that these collectibles and challenges fix the biggest problem with Dead Rising 4’s open world, namely that it wasn’t fun to explore. In DR4’s campaign, collectibles didn’t do anything to my knowledge, and the only other reason to go off the beaten path was the weapon blueprint; but these too were underwhelming, considering you could breeze through the campaign without them. In Frank Rising, the fact that perks such as higher health, more damage, etc. are tied to collectibles encourages visiting different parts of the map. The same can be said for the power upgrading challenges, which not only serve a purpose but also are fun and occasionally challenging diversions. The gameplay itself is an interesting, though somewhat baffling turn for the series. And like the pondering from a freshman philosophy major, I wonder if a Dead Rising title where you can’t pick up a single item is Dead Rising at all? Even the original release, in an era preceding all the weapon combos and other absurdities, had the hook of using almost everything you could see in the mall as weapons. In Frank Rising, West can only resort to swinging his hands wildly at enemies or utilizing his three extra powers, which are a leap attack, a spitting bile, and a shout that stuns foes. Without the use of firearms or melee weapons that have different weights and speeds, the gameplay devolves much more so into button mashing. Thankfully, there’s enough variety in both zombie powers and enemies encountered that the lack of accessories never felt an issue. There is a disappointing return of a problem I had with DR4: the best location in Willamette, the centrally-located mall, is used only once and after a certain point, players aren’t even able to return to it – at least not as far as I could tell. On my second playthrough, I made the mistake of not snatching all the collectibles before the point of no return. It was fairly frustrating. Frank Rising’s short length must be noted, as less than a handful of hours for $10 may be considered by some a lack of value. Quality trumps quantity, though, and because Frank Rising improves on many aspects laid out by Dead Rising 4, I recommend it to those who already own and might have felt disappointed by the original game. At the very least, the DLC brings replayability back into the game, all while making better use of Willamette’s open environment. And if that isn’t enough, then consider playing as Zombie Frank a welcomed novelty.